The disciples were very hungry for God and were eager to hear his word. Jesus wanted to use this occasion to teach his disciples a significant lesson. Although Simon was wearied from a night of fruitless labor, he nonetheless did what the Lord Jesus told him to do: At your word I will let down the nets. This incident tells us an important truth about how God works in and through each of us for his glory. God expects of us greater things than we can do by ourselves. When we cooperate in his works, we accomplish far beyond what we can do on our own. When we meet dissatisfaction and failure, do we press upon the Lord, like Simon, to hear his word and to receive his command? O LORD, our Abba Father, thank you for not leaving us in darkness. 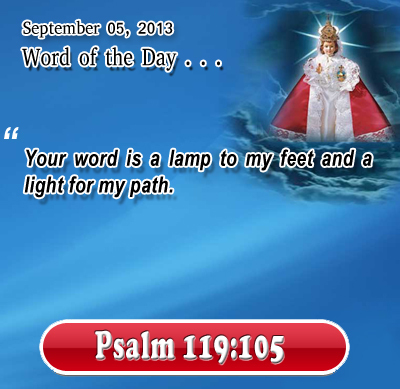 Your Word lights our path and your Son, the Light of the World, lights our life. Thank you for not leaving us alone to find our way. In Infant Jesus' name. Amen. 1While the people pressed upon him to hear the word of God, he was standing by the lake of Gennes'aret. 2 And he saw two boats by the lake; but the fishermen had gone out of them and were washing their nets. 3 Getting into one of the boats, which was Simon's, he asked him to put out a little from the land. And he sat down and taught the people from the boat. 4 And when he had ceased speaking, he said to Simon, "Put out into the deep and let down your nets for a catch." 5 And Simon answered, "Master, we toiled all night and took nothing! But at your word I will let down the nets." 6 And when they had done this, they enclosed a great shoal of fish; and as their nets were breaking, 7 they beckoned to their partners in the other boat to come and help them. And they came and filled both the boats, so that they began to sink. 8 But when Simon Peter saw it, he fell down at Jesus' knees, saying, "Depart from me, for I am a sinful man, O Lord." 9 For he was astonished, and all that were with him, at the catch of fish which they had taken; 10 and so also were James and John, sons of Zeb'edee, who were partners with Simon. And Jesus said to Simon, "Do not be afraid; henceforth you will be catching men." 11And when they had brought their boats to land, they left everything and followed him.